18 holes, par 68, 5,965 yards. Parkland/Woodland. Gleneagles golf resort, host venue to the superb 2014 Ryder Cup where Europe prevailed in an epic battle versus the unfortunate Americans, and also host to three superb golf courses, the PGA Centenary, the Kings and finally the Queens. With its two siblings, you can understand why the Queens course doesn’t get as much recognition and praise, but we beg to buck the trend. The Queens’ course C.V. shows a par of 68 and a yardage of just less than 6,000 yards, but what it lacks in credentials, it makes up in bite. This tremendous course features moorland and woodland characteristics with numerous ridges, valleys and ditches as well as water hazards. So challenging are the front-nine holes, even the best of players will struggle to make par. 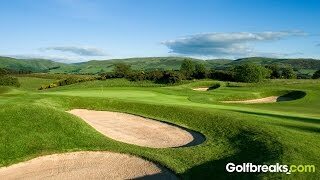 Yes there are more renowned golf courses in Scotland, but why not join the long list of golfing legends including amongst others Johnny Miller, Lee Trevino, Tom Watson and celebrities such as Burt Lancaster, Bing Crosby and the astronaut Alan Shepard, and enjoy the superb Queens course nestled in the Perthshire countryside on your golf vacation to Scotland. The nearest airports to Gleneagles are Edinburgh and Glasgow, both around an hour’s drive away, traffic permitting. One of the main priorities of the Gleneagles resort is to ensure guests are relaxed and a theme of informality runs throughout the resort. As such there is a very laid-back dress-code although they would prefer golfers avoid dressing in jeans on the course. Visitors are spoilt for choice when it comes to practise facilities. With an 11 acre championship level practise ground as well as numerous putting greens, it’s difficult to think of what they don’t have. There are no handicap restrictions on the Queens course.